(1) Connect the Techstream to the DLC3. 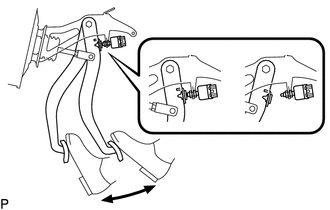 (2) Turn the ignition switch to ON. (3) Turn the Techstream on. (4) Read the DTCs following the prompts on the Techstream screen. Enter the following menus: Chassis / 4WD / Trouble Codes. (4) Operate the Techstream to clear the DTCs. Enter the following menus: Chassis / 4WD / Trouble Codes. (5) According to the display on the Techstream, select the trouble code data display with the clear button. (1) Using SST, connect terminals TC (13) and CG (4) of the DLC3. (3) Read DTCs from the AWD warning light on the combination meter. If the AWD warning light does not blink, perform relevant troubleshooting procedures. The relevant troubleshooting procedures are in the sections listed in the table below. 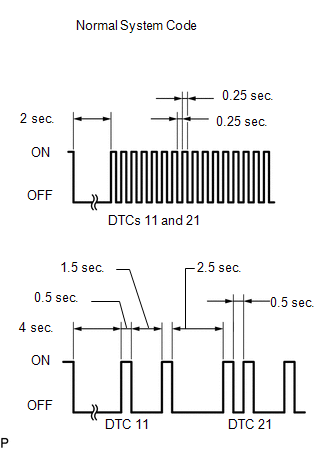 If more than 1 DTC is detected at the same time, the DTCs will be displayed in numerical order. As an example, the blinking patterns of the normal system code and DTCs 11 and 21 are shown below. DTCs are explained in Diagnostic Trouble Code Chart (See page ). (a) Using SST, connect terminals 13 (TC) and 4 (CG) of the DLC3. (c) Clear the DTCs stored in the AWD control ECU by depressing the brake pedal 8 times or more within 5 seconds. (d) Check that the warning light blinks in the normal system code pattern. (e) Remove SST from the terminals of the DLC3. 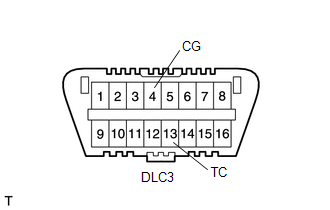 DTCs cannot be cleared by disconnecting the cable from the negative (-) battery terminal or removing the ECU-IG1 fuse.